← Las Mananitas Spirit Day Today! Don’t spend your summer tracking down all the school supplies for next year! 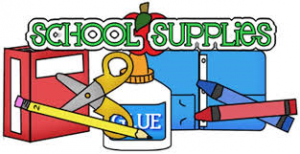 Pre-order school supplies from the PTO and they will be delivered to your child’s classroom before school starts. School supplies are $65 – that is $15 cheaper than last year and they are all name brand supplies!. You can order online HERE. The school ID is JCN000. You can also print out the order form and send cash or check (made out to Neill PTO). Skip making dinner and let Papa John’s do dinner! Mention Neill or use our unique online code NEILL1819 for online orders. We are excited to begin the year with a new fundraiser opportunity! Lopez Mexican restaurant will donate 20% of sales from Neill purchases made during our event! More details TBD. © Neill Elementary PTO 2019 - Powered by Digital PTO - Theme by Colorado Web Solutions & Belouga.